Several years ago I suffered with terrible insomnia. I exhausted every form of herb, therapy, treatment, etc. that was available. As a last resort I decided to try Acupuncture at a local establishment that specialized in these treatments. The reason I waited had nothing to do with the credibility of the treatment, but rather the image I had of me lying on a table with innumerable needles placed on every inch of my body. So when I did relent to acupuncture I was indeed quite desperate. Needless to say; no pun intended, acupuncture was nothing like what I had imagined. Acupuncture has been used in Eastern medicine for thousands of years, the principle is based on bringing the body back into balance or harmony using meridians or energy points. The needles were placed prudently on a few distinct areas of my body for a certain amount of time. The result was that I slept amazingly well that night. I did this every week until I could no longer afford the treatments. Acupuncture was not covered by my insurance and I had to pay out of pocket. Acupressure uses this same principle as acupuncture, but devoid the needles. Both are extremely effective at treating a host of ailments. I just recently; today, started using Yantra Mat for the recommended 10 minutes for newbies. I feel so ridiculously relaxed in the same way I felt after those acupuncture treatments. I plan on using this ten minutes before bedtime. 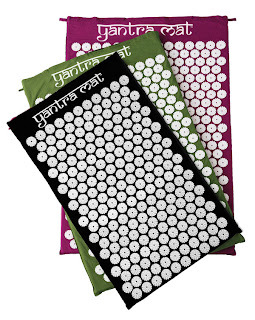 The top of the Yantra Mat is covered with 8,820 acupressure points in the form of little circular spikes. Regular use of the of the Yantra Mat can alleviate headaches, back pain, fatigue, insomnia, and more. Yantra Mat is also said to loosen tightness in the neck and jaw if used on the cheek area. So this would help with my TMJ. You can purchase Yantra Mat on their Website for $49, less than I was paying for one acupuncture treatment. Yantra Mat comes with its own tote so you can roll up the mat for easy storage. After seeing the benefits, you may want to leave it out at all times for easy access. Oh, I would love this. I am quite stiff in the morning hours and I have frequent backaches, so this look like it would help. My husband would be finally be having some breaks for not massaging my back for one night LOL thanks for sharing. I am so jealous! I have never had acupuncture but have been wanting to try! I would LOVE to try this mat! This mat seems awesome! I would love to try it out for my fatigue that just does not seem to go away. I have one of these - it's AWESOME. Even my 5yr old likes it! This is the best thing ever! When I use it I feel so much better. Any back pain that I have is gone!